Wrapping up this series on the liturgical uses of the American Indian missions along the St. Lawrence (see Part One and Part Two), we now arrive at the closely related Mohawk missions of Kahnawake and Akwesasne, where the Indian Mass reached a high point of development that was never equalled before and has never been equalled since. 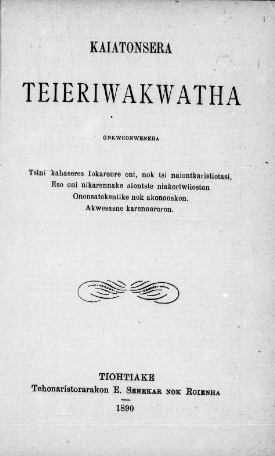 The Mass at Akwesasne, which was apparently identical to its parent mission of Kahnawake, was documented in the parish-book Kaiatonsera Teieriwakwatha (1890). This book shows a liturgy that, like the previous examples we have looked at, generally followed the Roman Rite but used a distinct cycle of native-language Introits to set the liturgical theme of the day. Yet whereas in other missions we looked at, we might only find half a dozen distinct Masses at most, the Kaiatonsera Teieriwakwatha has over thirty just for Sundays and Commons, not even counting those for feast days of the Sanctorale. At Akwesasne the major feasts were generally given their proper Roman Introits. The Christmas Day Mass is taken from the Puer natus est nobis, Epiphany’s from Ecce advenit dominator Dominus, Easter’s from Resurrexi, and Ascension’s from Viri Galilei. My Mohawk is not good enough to ascertain whether these Introits are direct translations from the Latin; many of them likely are, but there are also clearly instances when the text does not match—as in the Christmas Midnight Mass. In the Kaiatonsera there are only two Introits for Advent, two for Septuagesima, and three for Lent from Ash Wednesday to Passion Sunday. These last were simply rotated in a cycle. So the Introit for Ash Wednesday is used again for Lent 3; the Lent 1 Introit reappears at Lent 4, and the Lent 2 Introit reoccurs on Passion Sunday. The Sundays after Epiphany have three numbered Introits (labeled I, II, III), and the Sundays after Pentecost have four Introits (labeled I, II, III, IV). It is not explicitly stated how these numbered Introits were distributed, but they were probably also cycled consecutively throughout the season. Interestingly, the Introits for Gaudete and Laetare Sundays are entirely absent; so there are effectively no rose-colored Sundays in the use of Akwesasne. Native Introits were, at times, taken from Roman texts outside their own proper season. The Kaiatonsera’s Introit for Septuagesima and Quinquagesima is drawn from the Roman Respice in me of the Third Sunday After Pentecost, and the Introit for Sexagesima is Miserere me, Domine of the Sixteenth Sunday After Pentecost. the Roman Introit for Pentecost 16 (right), from a Graduel Romain of the diocese of Quebec (1896). There are a dozen Common Masses. Seven are for saints. Two are given for the Blessed Virgin Mary: Wari tekwanonweronnions for the Visitation and the Nativity of the Blessed Virgin, corresponding to the Salve, Sancta Parens of the Roman Rite; and Saiatatokenti Wari for the Annunciation and the Immaculate Heart. There is also a Mass for the dedication of a Church, the Nuptial Mass, and a Votive Mass for the Blessed Sacrament, as well as a Mass of the Dead. In complexity, the use of Akwesasne/Kahnawake is therefore far beyond the individual Masses or the primitive liturgical cycles of the other missions that we have already seen in previous articles. And while it is certainly not as elaborate as the parent Roman Rite from which it draws, it is nevertheless full enough to provide for an entire liturgical year, albeit a simplified one. What does this all mean for the modern parish? While much attention has been given lately to American Indian inculturation, typically this has focused on issues such as music, language, drums, and vestments. The fact of a unique liturgical use is, bafflingly, almost never brought up. I suspect that an unfortunate but widespread hostility to the traditional liturgy has had much to do with that. One can hardly appreciate the unique qualities of an Indian Mass without any knowledge of the ancient Roman liturgy it grew from. This is a shame, as the inculturative potential of the Akwesasne/Kahnawake Indian Mass is truly vast, with potential continent-wide applications from Labrador to California. Admittedly, this liturgy was a local usage of a couple of parishes, with a few traces of its larger influence found in other missions. But it is worth remembering that St. Francis Xavier at Kahnawake is not just a simple mission parish. It has for centuries boasted an outsized importance that has made it a spiritual, liturgical, hagiographical, musical, archival and even political center. It retains St. Kateri-related documents in over 80 Native languages, and for decades it has taken an interest in and spread its influence to dozens of other missions and nations through the magazine Kateri. Simply put, Kahnawake is the capital of American Indian Catholicism—at least as far as Canada and the United States are concerned. Thus, it is entirely appropriate that its liturgy become a model for other parishes of American Indian heritage. Its vernacular tradition can be held up and emulated throughout North America—providing an excellent way for native communities everywhere to retain their linguistic traditions even as numbers of speakers wane. Although there are, of course, significant cultural differences among the various American Indian Catholic communities, the Masses of the Seven Indian Nations can provide an incalculably important way to unite under a shared liturgical heritage. Whether in a Muskogean, Siouan, or Uto-Aztecan language, the essential ritual can remain largely the same. The Indian Mass can be adapted to any language and any mission, while never losing its Native provenance or its link to centuries-old tradition. Local diversity and pan-Indian continuity can both be accommodated. Moreover, the immense artistic value of native-language chant and polyphony has become increasingly apparent to classical musicians—and it will be to our eternal discredit if we within the family of the Church did not surpass everyone else in the cultivation, preservation, and promotion of our own artistic treasures. I am aware that what I am asking is no easy feat—and this being the early stages of research only complicates matters. For starters, we would need Mohawk scholars to translate the Akwesasne Introits so that they can then be compared to the Latin originals, and then we would need a whole new set of scholars to render these into other languages. And of course, the native liturgy itself has to be more fully investigated and defined than I am able to do in this article. 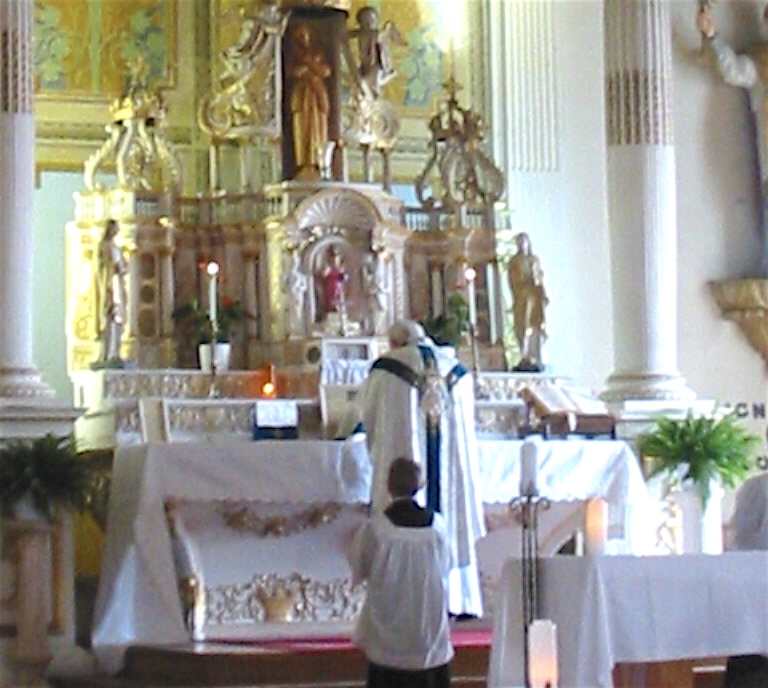 It seems a small price to pay, however, to allow this little mission community along the St. Lawrence, so physically unassuming but so spiritually powerful, to boast something that has traditionally been the prerogative of the greatest cathedrals and monastic orders of Europe: a local variation of the Roman Rite. Above all, we need to remember that the Indian Mass is no mere historical artifact. It is not a museum piece. It relates to the modern parish because, like all good liturgy, it is a timeless expression of an eternal faith. It is the ancestral legacy that many generations of American Indian Catholics have passed down to us—a legacy that ought not to be abandoned simply because we have failed to appreciate it.